The Gran Teatre del Liceu is one of the most popular opera houses in Europe and one of the most beautiful sights in Barcelona. The most important works of classical music were presented here by the greatest singers of the last two decades. Domingo, Pavarotti, Caballé, Callas, Tebaldi will always have a special place in the heart of the audience. The Gran Teatre del Liceu regularly hosts the largest Wagner Festival after the Bayreuth Festival. Book a guided tour in the grandiose opera house with the most important and representative rooms. The Gran Teatre del Liceu can be visited daily with several guided tours. You have the choice between two tours: mornings and afternoons. It's easy to book: choose your preferred date and time at the top of the right hand side, and enter the number of people you would like to book for. Guests with reduced rates (disabled, senior citizens, students) need to proof with a respective ID. A necessary accompanying person must be registered in the disability card. Without proof, admission can be denied. In this case there will be no refund. You can cancel the tour up to six weeks after the booking, but not later than the 15th of January of the following year. Of course, only if you have not attendet the tour. You can easily cancel by e-mail stating your booking number. The beginnings of the opera in Barcelona go back to the Sociedad Dramática de Aficionados in 1837. This union of liberal, armed citizen militia founded a musical conservatory. Under the direction of Queen Isabel II in 1838 it became the "Liceo Filármonico Dramático Barcelonés". With the Barcelona Card 25% discount on guided tours and 16,66% discount on the express-tour if bought at the ticket office. The success of the building "Liceu Filármonico Dramátic" brought a group of leading citizens to plan a new opera house. They wanted to build a more splendid opera house than would have been possible under royal management. To finance this, they founded a company that accumulated profits from stock trading. The members of the "Societat de Propietaris", the owners' company, reserved most of the lodges. On April 4, 1847, the Gran Teatre del Liceu was opened. It was built according to plans by architect Miquel Garriga i Roca. With 4,000 seats, it was the largest opera in Europe. From 1855 the Societat de Propietaris was solely responsible for the operation of the opera, since it had separated from the conservatory. In 1861, the Liceu was hit by a fire for the first time. The auditorium and the stage were completely destroyed. But only a year later, the opera house was reopened. Since 1986, there have been plans to expand and modernize the building. Based on these plans, made by Solà Ignasi de Morales, the Liceu was rebuilt. The original was almost completely preserved, since as many undamaged parts as possible were reused. Thus, the magnificent foyer and the equally splendid hall of mirrors were reconstructed according to the original rooms. Below the concert hall, an auditorium with a restaurant was built as a break room for the guests, and the stage was equipped with state-of-the-art technology. The curtain has been modernized and was designed by Antoni Miró. The upper floor seats got TV technology installed, since not all seats have a view on the stage. The geometry of the otherwise faithfully recreated concert hall has been slightly adapted to modern acoustics. The Gran Teatre del Liceu reopened in 1999 and now has nearly 2,300 seats on 6 levels. The Liceu is an integral part of Barcelona's culture of today. From the beginning, since its opening in 1847, theater and opera productions had been given to investors, who also received the proceeds from ticket sales. Excluded from this were the seats reserved for the Societat. However, in about 1975 it became apparent that this type of financing was no longer profitable. 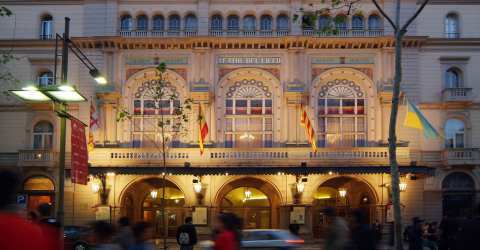 A sponsor of the city of Barcelona, the Catalan regional government and the Societat del Gran Teatre del Liceu, as the official name of the "Societat de Propietaris", took over the leadership of the house. In order to save one of the most famous operas the purely private type of sponsorship financing was converted to public funding in 1980. The fire on January 31, 1994 destroyed the Liceu almost completely. This had an extraordinary social impact on the Catalan society. It was debated whether the house should be rebuilt at all. A new legal basis was created to rebuild this symbolic building. The assets and all rights were transferred to a foundation, the Fundació del Gran Teatre del Liceu. From then on, the house was completely in public ownership. The long guided tour lasts about 50 minutes and you can see the stage, the backstage area and other rooms in the background of the stage. You can find the tour schedule in chapter "times". The Express Tour is a short, approximately 45-minute tour of the main areas of the house. Here you can see the foyer, the hall of mirrors, some boxes and the big concert hall. See chapter "times" for the tour schedule. The entrance for the guided tours is to the left of the main entrance and leads to the basement to a café and a shop where you can buy books as well as CDs. Before the shop the cash register and registration for the tours is located. You can also pre-book tickets for guided tours.